Who Really Wants to Call a Plumber? At a recent home inspection a real estate agent told me how much he dislikes it when I recommend raising the dishwasher drain line under the kitchen sink. I’ve worked with his clients on several occasions, but in his opinion this is an area where he feels that I’m being a little too picky by calling this out as an item needing repair. There probably aren’t too many plumbers around that have not received a phone call from a distressed homeowner who has dirty water in the bottom of the dishwasher. Plumbers must love these calls, because they can charge for a service call and typically repair the problem within a few minutes with just a screwdriver, a clamp and a screw or two. Granted, there may be other things in play, such as a malfunctioning dishwasher check valve on newer models, but the repair can be fairly simple. More often than not, the problem occurs when the drain line for the dishwasher is connected to a garbage disposer. In the process of shredding and chopping up food scraps, sometimes part of the effluent gets forced down the dishwasher piping as well as the drain line. When the dishwasher drain sags down right where it connects to the disposer, all kinds of food scraps and sink waste can follow the piping and under the right conditions can end up in the bottom of the dishwasher. 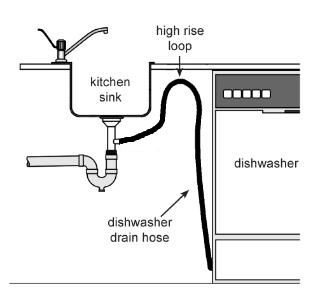 The solution: lift the dishwasher drain line and attach it to the cabinet wall or underside of the countertop so there is a loop as high up as possible under the sink. A more complex, and certainly more expensive, solution is to install a countertop air gap device that sits on top of the sink. I’ve only come across a handful of these during my Massachusetts home inspections. If installed improperly, these devices have a tendency to overflow from the opening on the front and spit water all over the top of the sink. They also require more tubing under the sink and can take up some of that precious storage space for all those cleaning products we like to keep on hand. Countertop air gap devices are required in a few states, including parts of California and more recently Minnesota. I understand and even appreciate the misgivings from the real estate agent whenever I mention this repair. However, I’d be willing to bet that he wouldn’t want to be the one getting the phone call when the disgruntled new homeowner finds an inch or two of stagnant and disgusting water in the bottom of the dishwasher after they’ve run the disposer for the first time.